The SeaWolf from all the other members of the family.Have Both jaws armed with strong conical teeth, and on the sides with two series of large tubercular molars, a biserial band of similar molars occupying the middle of the palate. By these teeth the seawolf is able to crush the hard shells of Crab Lobsters Sea Snails the The rocks between which it hides are usually strewn about with the broken shells of its prey. That it uses the teeth as a weapon of defence and deserves the character of ferocity generally attributed to it would appear to be rather questionable. The teeth wear down because of excessive grinding, so a new set grows in annually. 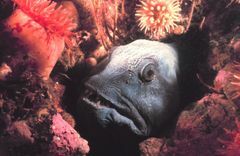 In the interim, however, it is supposed that the fish will fast for months while it waits for the new teeth to grow in.